Hello! It's getting close to Christmas now and every year I find it a struggle to think of what to add to my Christmas list. N asks me around this time of year what I'd like and my answer? Always seems to 'I don't want anything' and that just cannot be true. What is true is that I don't really know what's available out there to add to my wish list and maybe that is also true for you? So I'm hoping to write semi-regular posts leading up to Christmas (and possibly beyond if there is enough interest) and show you some gift ideas that a book lover like me (and I'm assuming you) might enjoy. I'm very excited about my first choice. My other bookish ideas won't have a time limit placed on them, but this one does. So you'll have to get in there quick. The lovely Luna from Luna's Little Library has been super creative this year and made up some absolutely gorgeous jewellery inspired by some of her favourite book covers. I mean it, they are beautiful! She had been asked to sell the jewellery but decided against replicating the necklaces and earrings and instead came up with the idea of an auction. The auction has already started and the bidding on some necklaces and jewellery sets are now closed. There's still plenty of time to dive into the auction and win yourself a very pretty literary-inspired necklace! Be quick though. Each item is available for three days only and the last items will go up on the 10th of November. 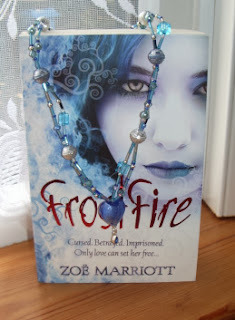 The Frostfire by Zoe Marriott necklace (above) auction has started today! The starting bids are very reasonable. A portion of the profit from each sale goes to very worthy causes. I love how the uniqueness of each of these necklaces and how well each of them corresponds with the book covers. I'm hoping that the success of this auction will inspire Luna to create more! If you have any questions about the bidding, postage costs, the charities that Luna will be donating to or anything else, please do visit this Questions page. There is the added bonus of being entered into a draw to win yet more jewellery for every bid. You can still bid on this necklace if you're quick about it! and Unhinged by AG Howard. 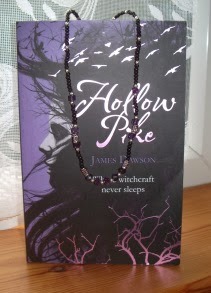 I also really love this Hollow Pike by James Dawson necklace (auction ends tomorrow!) I'm so glad to see so much #UKYA support! But... I love so many of the necklaces and jewellery sets, it was very hard to narrow it down! So, what are you waiting for? Wouldn't it be amazing to treat yourself to a lovely, book-inspired piece of jewellery? Or perhaps ask your family and friends to treat you instead? Head over to Luna's Little Library and don't miss out! Which of Luna's necklaces/sets is your favourite so far? Which one are you most looking forward to seeing? They really do, don't they? !